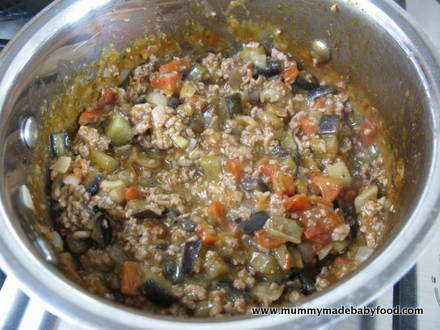 A quick pasta that is also one of the all-time favourite recipes, this bolognese is made with aubergine (or eggplant, as it is also known) and is a great way to introduce baby to the vegetable. Whilst in many parts of the world, bolognese sauce is often paired with spaghetti to make 'spaghetti bolognese', this is not traditionally the way it has been served in Italy. Traditional bolognese sauce is complex, involving a variety of slow cooking techniques and added ingredients. Outside of Italy, this sauce has been simplified to become a tomato-based sauce including mince meat. 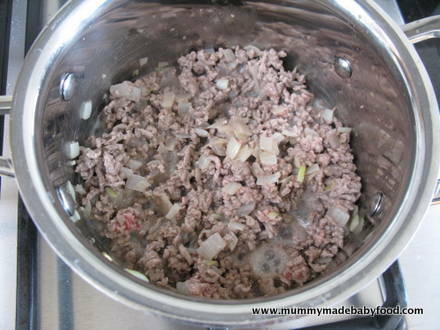 Bolognese is a quick pasta sauce to make and can be traced back to recipes using a meat-based sauce from the 18th century in Imola, near Bologna, Italy. 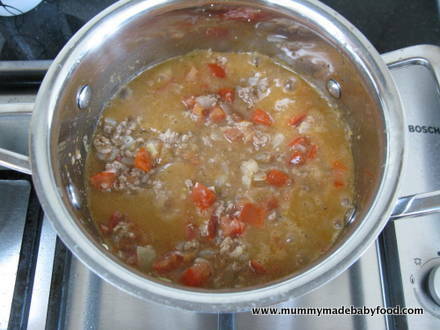 In Italy, the sauce is known as ragu alla bolognese, or simply as ragu. It is customarily served with tagliatelle pasta or used to prepare lasagne. Fortunately, the recipe below is based on the simplified version of the sauce, and whilst not traditional, it is no less tasty! Pasta stars or mini pasta shells are good shapes to use for babies and younger toddlers, whilst older toddlers may like spaghetti, or even tagliatelle, that has been cut to shorter lengths for easier eating. This recipe yields 7-8 servings and is suitable for freezing. Heat some oil in a saucepan. 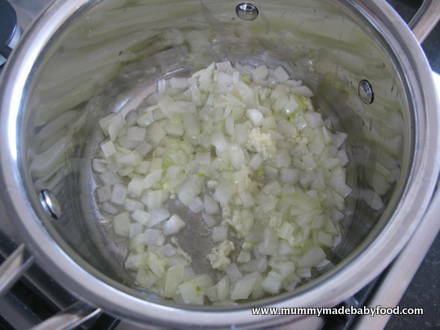 Cook the onion and garlic for 3-4 minutes until soft. Then add the tomato puree, tomatoes, herbs, flour and chicken stock. Bring to the boil, and simmer uncovered for 45 minutes. 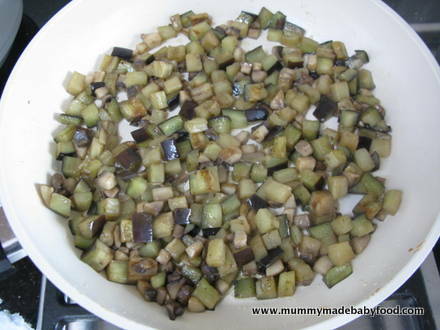 Meanwhile, wash and chop the aubergine into small cubes. Wipe the mushrooms clean and slice. Heat some oil in a frying pan, and cook the aubergine and mushrooms until golden. 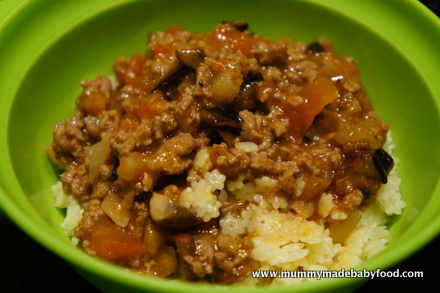 Drain the excess oil from the aubergines and mushrooms, and add to the meat sauce when it is done. Follow the cooking instructions on the pasta packet, and time it to finish cooking with the meat sauce. Drain the pasta, and dress it with the meat sauce. Allow it to cool sufficiently before serving.